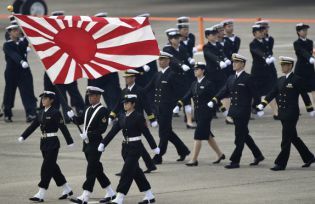 Self-Defence Force members march during an air review at Hyakuri air base in Omitama, Ibaraki prefecture, Japan. Shujiro Yazawam Professor Emeritus from Hitotsubashi University and Seijo University in Tokyo explains that Japan is on the brink of changing from a pacifist state to one prepared to go to war if necessary. Now, more than ever, we must refocus international scrutiny on the country’s social movements. What do you know about Japan? Answers to this question vary, but I can guess how familiar someone is with Japan by paying attention to the Japanese loanwords he or she uses. I am sure you know the following words: sukiyaki, tofu, tempura, sushi (foods), karaoke, bonsai, manga, otaku (cultural terms), kaizen, kanban, karoshi (business terms), and various other words such as tsunami, kamikaze, and hikikomori. Japan’s delicious foods, interesting culture, management, hard work, and sometimes even its disasters and discord are the main components of its image in other countries. Shujiro Yazawa is professor emeritus at Hitotsubashi University and Seijo University in Tokyo, and ex-president of the Japan Sociological Society. He was a member of the Executive Committee of the International Sociological Association from 1994 to 2002 and a board member of Research Committee 47 (Social Classes and Social Movements) of the ISA until 2014.